Every culture seems to have several unique ways of not only celebrating New Year's day but also insuring good luck for the following year. I must admit that in my family, my mother (a Tibetan scholar) followed the Tibetan tradition of calling out for Rabbit as the year turned new. I have never understood why entirely -- Trickster is hardly noted for being dependable -- yet I do it dutifully every year, no matter where I am. Even as friends around me are clinking glasses and singing Robbie Burn's Auld Lang Syne, I am whispering under my breath "Rabbit, Rabbit," before joining in the song. Here's an interesting list of New Year's superstitions, ranging from eating black eyed peas for luck to making sure nothing leaves the house New Year's Day. Also have a look at this list of foods specially prepared for New Year's day (I like the Cuban tradition of eating 12 grapes at midnight!). So, gentle readers, what are your New Year's traditions and superstitions? What do you do to welcome in the New Year and along with it, luck? 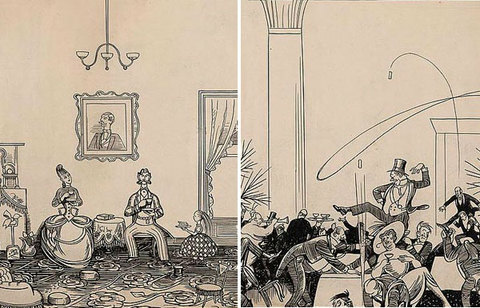 *Art above is from Rea Irvin, depicting a Happy New Year in 1867 and 1917...see how times have changed! "Keep it up well, do they!" Hailed by our sanguine sight. Thy entrance here is undesired. Must we avow what we would close confine? it the fault may not be thine." As we close the door on another year, and cross over the threshold towards a new one, my New Year's resolution is to live life more mindfully. Mary Oliver shows us how. Oliver is the Pulitzer Prize winning author of American Primitive, Twelve Moons, Dream Work, House of Light, and other gorgeous collections of poetry and prose. "Mindful" comes from her 2005 collection, Why I Wake Early. 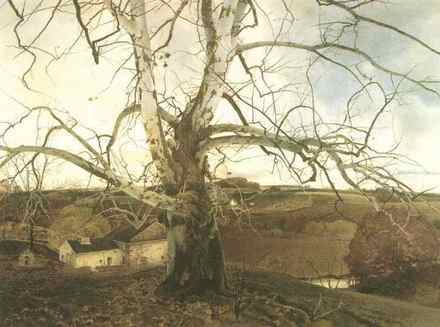 The painting above is "Pennsylvania Landscape" by Andrew Wyeth. 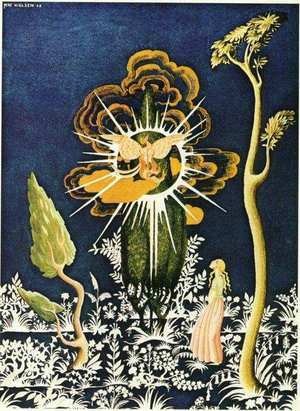 I've always thought of Magical Realism as a literary movement, but an interesting essay on the Ten Dreams Galleries site explains the origins of the term in an art movement with its roots in World War I. The movement began in Europe just after the war (preceding Surrealism by a few years) and in North America a decade later. "The term 'Magischer Realimus' was first used by German art critic Frank Roh in 1925 to describe a strong current in the arts toward realism...Art critics who had previously promoted Expressionism felt that a new generation of artists were producing superficial work, intended purely to exploit. At the same time, many artists felt that the Modernist movements had moved too far in the direction of abstraction. 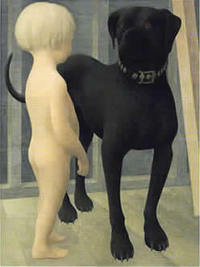 These same artists developed a realistic style, portraying everyday life but adding a twist of the bizarre and unusual. 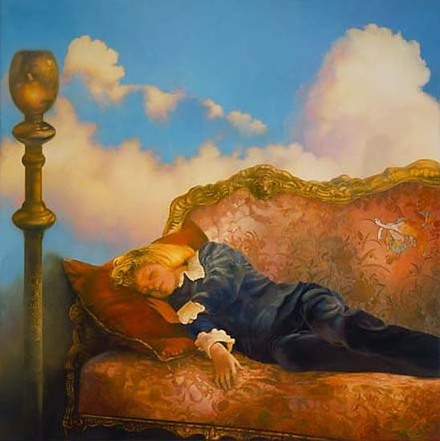 Magical Realism painters added dreamlike and fantastical elements to their art, but their subject matter still always remained within the realm of the possible." Go here to read the full essay and see examples of Magical Realist art. 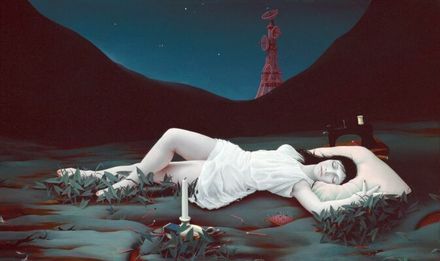 The images in this post are by Pyke Koch, Alex Colville, Gino Severini, and George Tooker. The painting below by Dutch artist Paul Christiaan Bos is a contemporary work in the Magical Realist tradition. 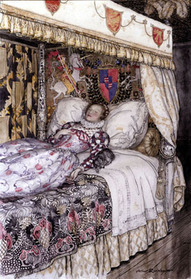 Yesterday we told you about the terrific illustration exhibition running at the Dulwich Picture Gallery in London. 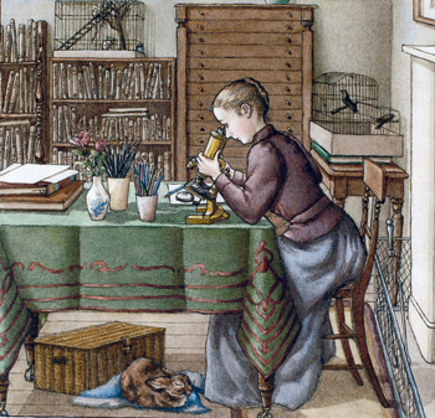 If you can get to London quickly, there's also a terrific show on until January 5th at the Chris Beetles Gallery: The British Art of Illustration, 1800 - 2007 -- featuring 1000 pictures covering 200 years of illustration history. 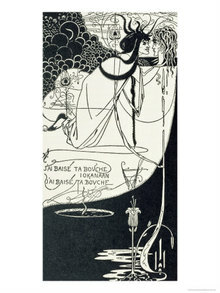 "With the death of Aubrey Beardsley in 1898, the world of the illustrated book underwent a dramatic change. Gone were the degenerate images of scandal and deviance. The age of decadence was softened to delight rather than to shock. Whimsy and a pastel toned world of childish delights and an innocent exoticism unfolded in the pages of familiar fables, classic tales and those children’s stories like The Arabian Nights and Hans Andersen's Stories. These were published with lavish colour plates and fine bindings: these were the coffee table books of a new age. "As a result a new generation of illustrators emerged. This new group of artists was intent upon borrowing from the past, especially the fantasies of the rococo, the rich decorative elements of the Orient, the Near East, and fairy worlds of the Victorians. 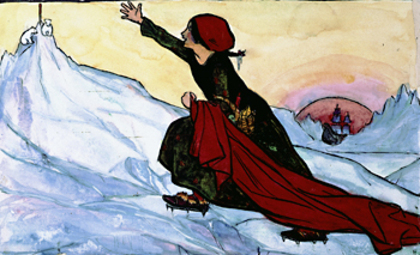 The masters of this new art form were artists like Edmund Dulac and Kay Nielsen, whose inventive book productions, with those of Arthur Rackham, became legendary. 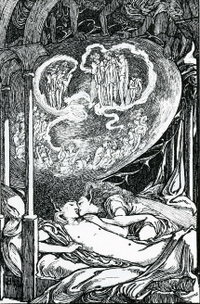 Disciples gathered, like Jessie King and Annie French, the Scottish masters of the ethereal and the poetic, the Detmold Brothers, masters of natural fantasy, as well as those who remained in Beardsley’s shadow: the warped yet fascinating works of Sidney Sime, a joyously eccentric coal-miner turned artist, Laurence Housman, master of the fairy tale, the precious inventions from the classics by Charles Ricketts, the Irish fantasies of Harry Clarke, himself a master of stained glass as well as the gift book, and the rich and exotic world of Alaistair. 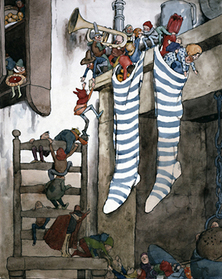 Children’s stories were transformed by the imaginations of a group still bowing to the Victorians Walter Crane, Randolph Caldecott and Kate Greenaway and the fairies of Richard Doyle but these were now given a more colourful intensity by Charles Robinson, Patten Wilson, Anning Bell, Bernard Sleigh and Maxwell Armfield. "The exhibition of British fantasy illustration will be the first such exhibition in Britain and the first worldwide for over 20 years (the last being in New York in 1979). All works, of which over 100 are planned, will come largely from British museums and private collections, many of these will never have been seen publicly before in Britain. The exhibition is curated by Rodney Engen." Visit the gallery's website for more information (including pictures, videos, and an audio file of the Director's Lecture), or to purchase an exhibition catalog. 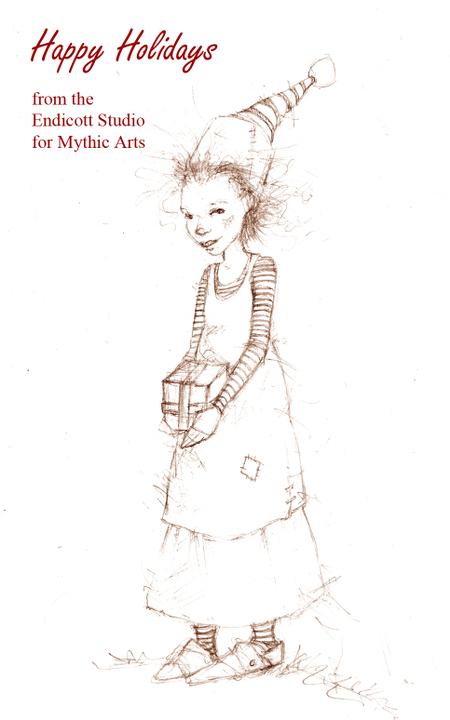 The Dulwich Picture Gallery is also running a "Create A Fairy Tale Illustration" competition, with entries due Janurary 28th. The competition rules are here, and you can view the current entries here. 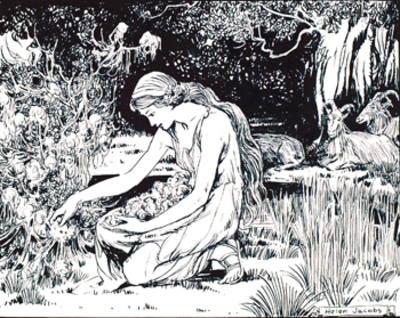 The "wild child" of the forest has long been a staple of myth and folklore, and thus also of magical fiction ranging from Rudyard Kipling's The Jungle Book to Wild Boy by Jill Dawson (for young adult readers) and Alice Hoffman's Second Nature (for adults). 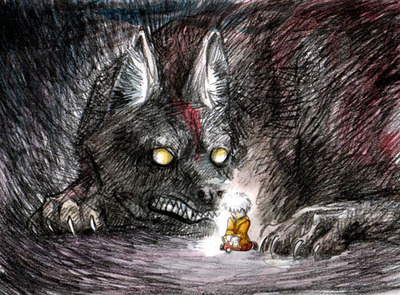 Though some historical tales of actual wild children have turned out to be hoaxes, others have been well documented and the occasional case, surprisingly, still arises today, such as this recent account of a boy living with wolves in central Russia. In India in the 1920s two small girls were discovered living in the wild among a pack of wolves. They were captured (their "wolf mother" shot) and taken into an orphanage run by a missionary, Reverend Joseph Singh. Singh attempted to teach the girls to speak, walk upright, and behave like humans, not as wolves — with limited success. His diaries can be read online here, and are fascinating if occasionally horrifying. 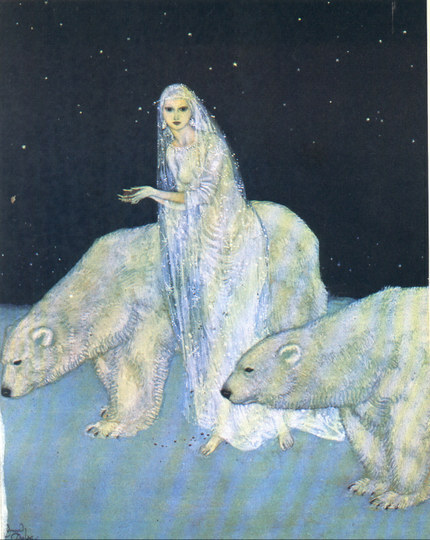 Several works of fiction were inspired by this story, but the ones I particularly recommend are Jane Yolen's novel Children of the Wolf and Karen Russell's story "St. Lucy's Home for Girls Raised by Wolves" (in her collection of the same title). For more about wild children I recommend Savage Girls and Wild Boys: A History of Feral Children by Michael Newton. 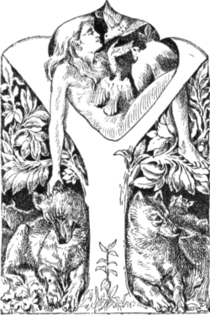 You also might be interested in my article in the JoMA archives: Lost and Found: The Orphaned Hero in Myth, Folklore, and Fantasy. There's a reading list of recommended fiction on page 3 of the article. Art credits: The drawing at the top of this post is by Tang Sin Yun; you can see more of the artist's work here. The second drawing is by Rudyard Kipling's father, John Lockwood Kipling. Our Sunday Poem -- in honor of Winter Solstice (and of the 16th century cottage discussed in the post below) -- is "Now Winter Nights Enlarge" by the 16th century English poet and composer Thomas Campion. 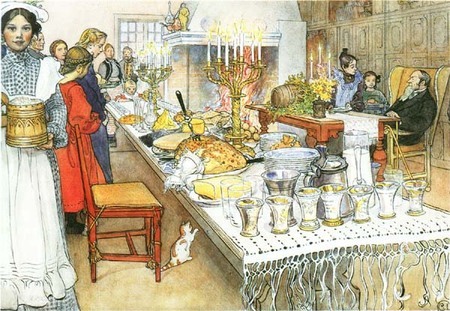 The art is "Christmas Evening" by the 19th/early-20th century Swedish painter Carl Larsson.